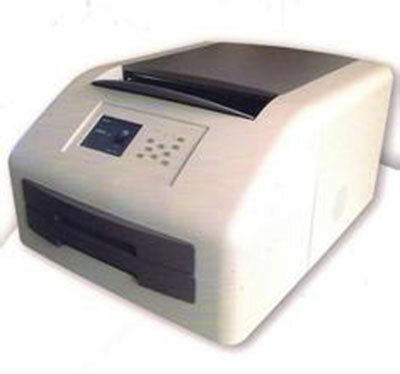 The printer applies the most environment-friendly direct thermal printing technology, and no chemical liquid is needed. No silver halide or other metallic component in Lucky dry film. The printing process does not generate any chemical waste or toxic substance or gas. Used film can be disposed as household waste rather than industrial one. The thermal imaging layer of the film is consisted of microcapsules, which are formed by nano raw material. With the help of high resolution thermal head, the final image resolution is 320dpi. 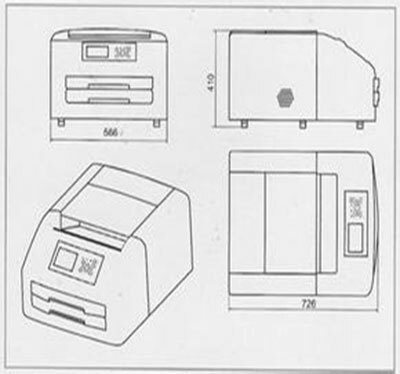 Lucky DryMate-1601 printer is equipped with two magazines, and each one accommodates 100 sheets of film. The printer is applicable to 4 sizes of film: 8*10 inch, 10*12 inch, 11*14 inch and 14*17 inch. With the unique formulation technology, the loading and printing of Lucky dry medical film can be carried out in daylight rather than in darkroom. The convenient operation reduces the time and effort of the operator. The operator can choose Chinese or English display on the 5-inch LCD screen as per his/her own preference. It makes Lucky DryMate-1601 printer more user-friendly and convenient in operation.